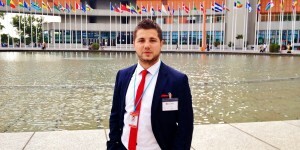 The Member of the Month of November is Alin-Florin Calin. He is an AEGEE member that was born in Western Romania and grew up in Eastern Austria, currently studying international law and history in Vienna. He got involved with AEGEE through local board activities in Vienna, the first experience that awoke his passion for AEGEE, followed by his first Agora in Alicante and the involvement in Juridical Commission – all this within one year. 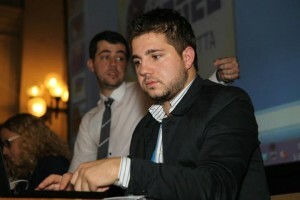 He knew from the very beginning that the European level of AEGEE was the perfect place for him. He explains that the path became clearer when he got a better insight of the full structure of AEGEE. That made him aware of the fact that he wants to focus on the external relations body of AEGEE, the Liaison Office (LO), and deal more with international relations. He has just finished his term representing our Network in the Organization for Security and Co-operation in Europe (OSCE) and at the same time joined the team which represents AEGEE in the United Nations (UN). Since the last activities were very close to international relations, he also decided to join the International Politics Working Group (IPWG) board while doing his UN-related work. Alin joined AEGEE because of his desire to be involved in an international environment and the possibility to join the Summer University Transsiberian Dream Volume 3 of AEGEE-Moskva . This was an old adventure dream of his – going mostly by train and bus from Saint Petersburg all the way through Asia to Dubai in seven weeks. The reason why he became more and more involved in AEGEE was an event in his first active months where he had a lot of fun and met the first interesting friends in AEGEE. 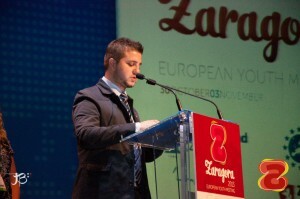 What followed was the first AEGEE love affair, the first Agora, the first European level task and now he is interviewed as Member of the Month, having been chosen from among 13.000 members. The AEGEEan: You are very active on the European Level of AEGEE, what motivates you to take part in so many different projects? It is a way of working that is totally different from local activities. You are working in international teams on international politics. I love the chance to have an impact on AEGEE’s way which is related to my interests and abilities. This gives me the feeling that I do something relevant for the Network, and for me in terms of developing new skills. I try to achieve all my aims in a short term, which is very demanding but I do need the challenge. You take part in many conferences in general, how do you find time for it? It is all about time management – which I still need to improve. Often I simply take the time to attend the events because I just enjoy this experience. It is a very good way to learn a lot in many ways like thematic, cultural and social. But quite frankly, it is a lot of fun! You have recently joined the IPWG board, what made you interested in joining that WG and what will you focus on there? What made me do this is my interest for international politics, the potential to establish with my IPWG board new projects and to have an impact on these topics in AEGEE. Moreover I will keep a close eye on making some changes because I do see the need to reform a few things. Our Action Agenda is not finished yet. You have also launched a new project related to election observation. What is that about? Election observations in AEGEE were inspired by my involvement in OSCE activities and my previous terms in JC. After attending the Human Dimension Implementation Meeting of OSCE this October as a part of AEGEE delegation, we decided to create internal election observations in AEGEE because the Network is the right place to train young persons to support democracy and peace. Our vision is to establish observations in various elections on European and local level, as well as in and outside of AEGEE in the long term, hopefully. Were there many people interested in it at the Agora in Zaragoza? We had on the spot a team of 20 members and we are now developing the project in order to have our first activities in 2014. Interested members are always welcome, people who are ready to take initiative and to put their ideas into practice. I am a person who likes to have things done but cannot do everything by myself – so I do appreciate team work and own initiatives a lot. I am extremely glad to have Thomas Leszke on board because he is a very experienced person. We have already a strong team but are still looking for more members to join us. You took part in the second best Summer University (SU) this past summer: “Scandinavian Dream”. What do you think about the SU? What made you apply to go there? What made me apply is the concept of Travelling Summer Universities, the cities we visited and all the party people I know from Copenhagen and Helsinki. I just wanted to spend my summer in the Scandinavian and Baltic countries with those friends. It ended with three Summer Universities – as participant, helper and visitor. I had one of the best summers I can imagine. The Scandinavian Dream team did an extremely good job and if the main organizer of the best-ranked SU (Catania) was not a participant and inspired by our time together beforehand in the second-ranked SU Scandinavian Dream, they would not have made it as the best SU, for sure. So it was team work again. In terms of the future Alin is very mysterious. His goal is to simply keeping up permanent involvement, and a trip to Greece; and he tells The AEGEEan that he might event submit a candidature for Comité Directeur. AEGEE has been the ignition for many paths he has beaten. Only time will tell what the future holds for this very active Member of the Month. Congratulations!